Whenever nodes are updated (for instance, the May 2018 upgrade to CentOS 7), if there is a significant change to them then the SSH key fingerprint is likely to change. As you've already stored the fingerprint locally, you will receive a key mismatch error like "WARNING: POSSIBLE DNS SPOOFING DETECTED!" and "The RSA host key for login.rc.fas.harvard.edu has changed". To fix this, you will need to remove the key in question from your computer's local known_hosts file. If you are on a Mac or Linux, you can use the following command from a terminal window on your computer. 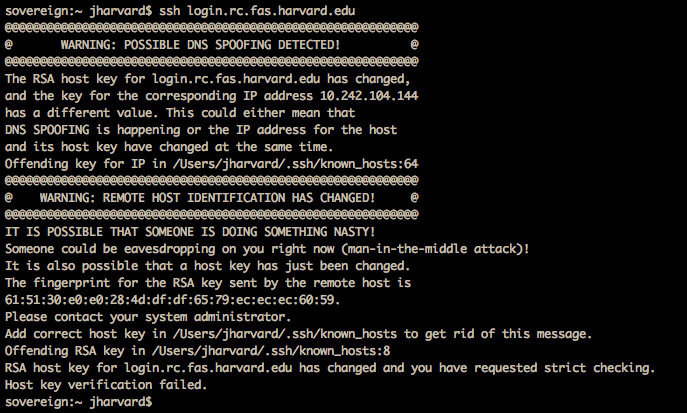 If the error was for a specific node, replace 'login.rc.fas.harvard.edu' with the full name of that host. You can now log into the node and will receive an all new request to store the new SSH key. Please note that there are several nodes behind the 'login.rc.fas.harvard.edu' hostname, so you may receive more errors like the above. Answering yes will allow you to continue. Restart your computer, changes won't take effect until after a restart.